Trashed is a documentary featuring its executive producer, actor Jeremy Irons. It examines the encroaching problem of global waste. After a yacht captain stumbled across the Great Pacific Garbage Patch in the late 1990s, scientists soon began finding similar patches of plastic waste in oceans around the world. They've since identified at least five, each fed by currents that carry plastic bags, bottles and other trash into vast vortices of seawater known as gyres. Since most plastic isn't biodegradable, this trash keeps swirling around for years, often crumbling into smaller pieces but refusing to fully break down. Much like carbon dioxide emissions — which linger stubbornly in the sky as they fuel climate change — garbage patches have come to symbolize the effects of man-made pollution run amok. And now, thanks to a new study by Australian scientists, we have a clearer picture of just how amok all this pelagic plastic really is. Using GPS-equipped drifter buoys to model the travels of maritime trash, researchers at Australia's Center of Excellence for Climate System Science report a sobering discovery: Even if no plastic waste entered the oceans after today, Earth's garbage patches would still continue growing for hundreds of years, both because of plastic's longevity and its long transit time to the gyres. Just how much plastic is there floating around in our oceans? "These patches are not going away," says lead author Erik van Sebille, an oceanographer at the University of New South Wales, in a video statement about the study. "The garbage patches will stay there for at least the next thousand years." Despite a name that makes them sound like seafaring landfills, garbage patches are actually nebulous and low-profile, consisting mostly of small plastic bits floating below the surface. And while that may seem less dramatic, the diffuse nature of garbage patches makes them more nefarious and harder to deal with, van Sebille points out. "If you sail through these areas, you will not see big lumps of plastics or rubber duckies or things like that," he says in a press release." The sun and interaction with the ocean breaks the plastics down into very small pellets that are almost invisible to the naked eye. 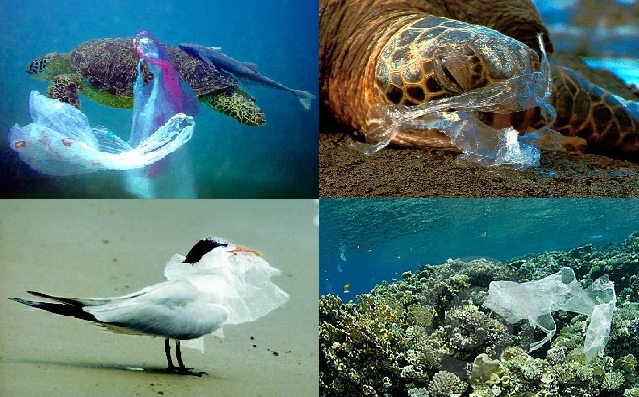 However, these plastics even at this small size do affect ecosystems — fish and albatross swallow these plastics, while phytoplankton can use the floating pellets to stay buoyant and float near the surface, where they grow best. "Plastic is also the canary in the coal mine," he adds. "Poisonous chemicals, [which] are much more hazardous to the ecology, ride the currents in the same way and are actually absorbed by the plastic pellets." Not only will the five biggest, best-known garbage patches continue growing for centuries, but the researchers also say a sixth one is in the offing. "Interestingly, our research suggests a smaller sixth garbage patch may form within the Arctic Circle in the Barents Sea," van Sebille says, "although we don't expect that to appear for another 50 years." The buoys also helped the researchers determine that garbage patches are surprisingly cosmopolitan, containing plastic not just from nearby coastlines, but from around the world. "This means that garbage from any country can end up in any one of these garbage patches," van Sebille says. "This tells us that no single country is responsible. Ocean garbage is an international problem that requires an international solution." But if cutting off their plastic supply won't stop the patches' growth for at least 1,000 years, what kind of international solution is possible? Van Sebille admits the task is daunting, and says any cleanup efforts would be futile. Instead, he suggests focusing on ways to improve the garbage patches' diet. "There's really no solution for getting the plastic out of the ocean. It's too small, too diverse, too thin to get out there with a ship and pick it up," he says. "Of course, the way to go then would be to make plastics that do break down, plastics that even if they get into the ocean, don't really have the time to accumulate in these garbage patches, because they will just disintegrate." As big and fast-growing as garbage patches are, however, they're still just one symptom of a broader problem. For the next stage of his research, van Sebille plans to study the dynamics of plastic waste closer to coastlines. "Clearly, by the amount of plastic found on beaches, not all of it ends up in the gyres to form garbage patches in the deep ocean," he says. "We need to find out what happens to the plastics closer to land, where most fishing occurs, and what effect that has on the environment around our coasts." Soviet-era submarines dumped more than 30 years ago in the Arctic Ocean are threatening a major nuclear catastrophe. The experimental sub K27 was sunk at a depth of just 33 metres, a hundred times below international guidelines. Some scientists claim the vessel, which was deliberately sunk in the Kara Sea, is already leaking radioactive material. "A creeping catastrophe has already begun. The longer these submarines are under water the greater the danger that more and more radioactivity will escape and contaminate the sea all around it," said German nuclear security expert Wolfgang Renneberg . An even bigger danger is the highly enriched nuclear fuel in its reactor, say scientists. In August, Russia released details of 19 subs, 14 nuclear reactors and thousands of other pieces radioactive waste lying at the bottom of the ocean. As well as key fishing grounds, the Kara Sea is thought to hold more than 37 billion barrels of oil. Russia and Norway are studying how to safely raise the K-27 from the seabed. For more than a decade, Western governments have been helping Russia to remove nuclear fuel from decommissioned submarines docked in the Kola Peninsula - the region closest to Scandinavia. But further east lies an intact nuclear submarine at the bottom of the Kara Sea, and its highly enriched uranium fuel is a potential time bomb. This year the Russian authorities want to see if the K-27 sub can be safely raised, so that the uranium - sealed inside the reactors - can be removed. They also plan to survey numerous other nuclear dumps in the Kara Sea, where Russia's energy giant Rosneft and its US partner Exxon Mobil are now exploring for oil and gas. Seismic tests have been done and drilling of exploratory wells is likely to begin next year, so Russia does not want any radiation hazard to overshadow that. Rosneft estimates the offshore fossil fuel reserves to be about 21.5bn tonnes. The Kara Sea region is remote, sparsely populated and bitterly cold, frozen over for much of the year. The hostile climate would make cleaning up a big oil spill hugely challenging, environmentalists say. Those fears were heightened recently by the Kulluk accident - a Shell oil rig that ran aground in Alaska. But Charles Emmerson, an Arctic specialist at the Chatham House think tank, says Arctic drilling is a "strategic imperative" for Russia, which relies heavily on oil and gas exports. It is a bigger priority for Russia than Alaskan energy is for the US, he says, because the US now has a plentiful supply of shale gas. That and environmental concerns make the Arctic more problematic for Americans, he told BBC News. "In the US the Arctic gets great public scrutiny and it's highly political, but in Russia there is less public pressure." Russia is rapidly developing the energy-rich Yamal Peninsula, on the eastern shore of the Kara Sea. The retreat of Arctic summer sea ice, believed to be evidence of global warming, means liquefied natural gas tankers will be able to reach the far east via Russia's Northern Sea Route in future. On the western flank is a closed military zone - the Novaya Zemlya archipelago. It was where the USSR tested hydrogen bombs - above ground in the early days. Besides K-27, official figures show that the Soviet military dumped a huge quantity of nuclear waste in the Kara Sea: 17,000 containers and 19 vessels with radioactive waste, as well as 14 nuclear reactors, five of which contain hazardous spent fuel. Low-level liquid waste was simply poured into the sea. Norwegian experts and the International Atomic Energy Agency (IAEA) are satisfied that there is no evidence of a radiation leak - the Kara Sea's radioisotope levels are normal. But Ingar Amundsen, an official at the Norwegian Radiation Protection Authority (NRPA), says more checks are needed. The risk of a leak through seawater corrosion hangs over the future - and that would be especially dangerous in the case of K-27, he told BBC News. "You cannot exclude the possibility that there is more waste there which we don't know about," he said. Igor Kudrik of the Norwegian environmental group Bellona says there is even a risk that corrosion could trigger a nuclear chain reaction, in the worst-case scenario. A torpedo explosion and fire killed 118 Russian sailors, in a drama which gripped the world's media. The Russian navy was heavily criticised for its slow response. But another ill-fated Russian nuclear-powered sub - the K-159 - remains at the bottom of the Barents Sea, in international waters. And in the Norwegian Sea lies the K-278 Komsomolets, reckoned to be too deep to be salvaged. Mr Amundsen says Russia is finally giving the radioactive waste problem the attention it deserves, and "we're very happy they are focusing on this now". K-27 was an experimental submarine - the first in the Soviet navy to be powered by two reactors cooled by lead-bismuth liquid metal. Disaster struck in 1968, when radioactive gases escaped from one reactor, poisoning crew members who tried to repair it at sea. Nine sailors died of radiation sickness, but the Soviet military kept it secret for decades. The navy gave up trying to repair K-27 and scuttled it illegally in 1981 off Novaya Zemlya. It lies just 30m (99ft) beneath the surface of Stepovogo fjord - though international guidelines say decommissioned vessels should be buried at least 3,000m down. A nuclear submarine that was once the pride of the Soviet navy now lies abandoned in the Arctic and Russia is considering salvaging it. K-27 still contains highly enriched nuclear fuel - extremely toxic, but so far no leaks have been detected. 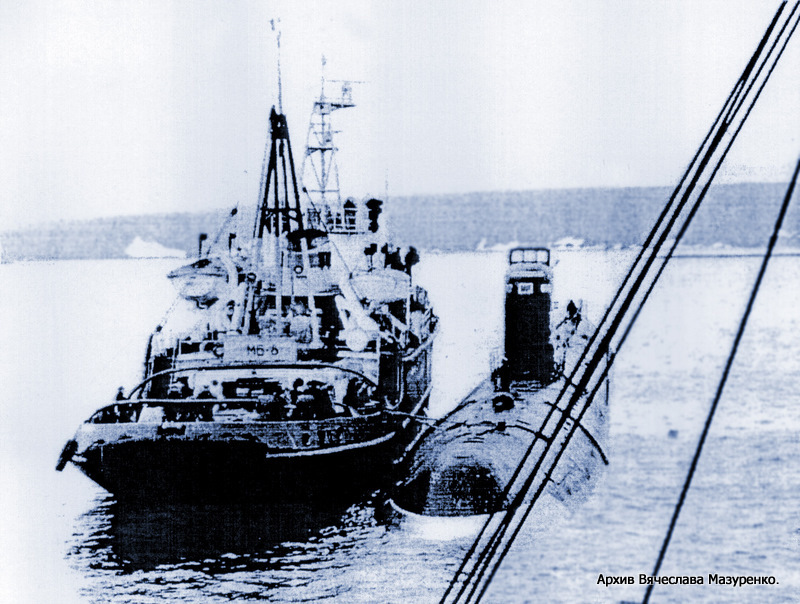 It was dumped in the Kara Sea in 1982, after a reactor accident which killed nine sailors. Last September a joint Norwegian-Russian expedition examined the wreck with a remotely operated vehicle (ROV) equipped with a video camera. Some other nuclear dump sites were also examined and they found no signs of any leak, but the investigations are continuing. Beyond the Kara Sea, Russia is forging ahead with exploration of the Arctic seabed, collecting data for a claim to areas beyond its waters. Other Arctic countries are doing the same, aware of the frozen wilderness's importance as the planet's more accessible resources are depleted. A UN body, the UN Convention on the Law of the Sea (UNCLOS)., will adjudicate on the claims. As if to underline the strategic priorities, Russia is boosting its military presence in the Arctic and the Northern Fleet is getting a new generation of submarines, armed with multiple nuclear warheads. The Archipelago of the Azores is composed of nine volcanic islands situated in the North Atlantic Ocean, and is located about 1,500 km (930 mi) west of Lisbon. The islands, and their Exclusive Economic Zone, form the Autonomous Region of the Azores, one of the two autonomous regions of Portugal. "Açores Insulae" ("Ilhas dos Açores"), Luís Teixeira, c. 1584. The discovery and settlement of the Azores archipelago, much like the islands of Madeira, is one of the more controversial aspects of the Portuguese Age of Discovery. In addition to many theories, myths and stories written about the Azores there have been various Genovese and Catalan maps produced since 1351 that identified islands in the Atlantic. Some chroniclers note that sailors knew of the islands, and visited them during return voyages from the Canary Islands (about 1340–1345), during the reign of King Afonso IV. In "A History of the Azores" by Thomas Ashe written in 1813 the author identified a Fleming, Joshua Vander Berg of Bruges, who made land in the archipelago during a storm on his way to Lisbon. Ashe then claimed that the Portuguese explored the area and claimed it for Portugal shortly after. Other stories note the discovery of the first islands (São Miguel Island, Santa Maria Island and Terceira Island) were made by sailors in the service of Henry the Navigator, although there are few written documents to support the claims. Supporting the official history of the islands are latter day writings, based on oral tradition, that appeared in the first half of the 15th century. Legends and myths also developed during pre-official history to include myths about Prester John, the "Ilhas Afortunadas" (the Fortunate Isles), the "Ilhas Azuis" (the Blue Islands), the "Ilhas Cassiterides" (the islands of Tin and Silver) or "Ilhas de Sete Cidades" (the islands of the Seven Cities), all noting the knowledge of undiscovered lands in the middle of the Atlantic. Officially, the first islands were "discovered" in the 15th century (in 1431) by Gonçalo Velho Cabral a Captain in the service of Infante D. Henrique, though credit is also given to the explorer Diogo de Silves (in 1427). Although it is commonly said that the archipelago received its name for the goshawk (Açor in Portuguese) due to its being a common bird at the time of discovery, it is unlikely that the bird nested or hunted in the islands. Some people, however, insist that the name is derived from birds, pointing to a local subspecies of the buzzard (Buteo buteo) as the animal the first explorers erroneously identified as goshawks. 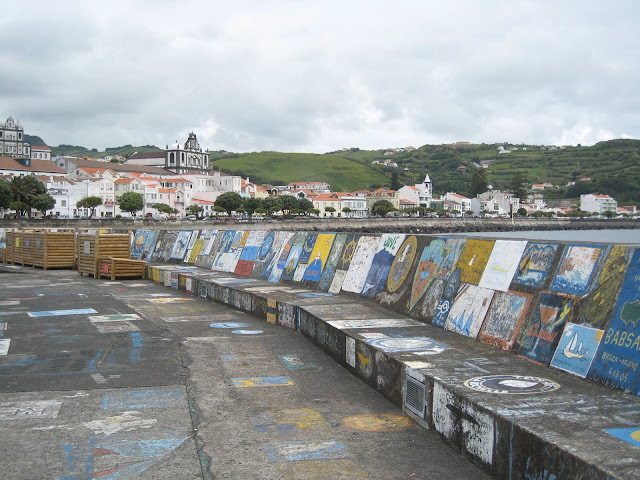 A long tradition in Horta (Faial island) is to paint a remembrance of your ship. Consequently, the shipbuilding industry developed in many islands, from small fishing boats, to whaling sloops to larger passenger services. Passenger traffic to the main islands (São Miguel, Santa Maria, Terceira and Faial) began in the 17th century. The Azores High (also known as North Atlantic (Subtropical) High/Anticyclone or for short, NASH, the Bermuda-Azores High, or the Bermuda High/Anticyclone in the United States) is a large subtropical semi-permanent centre of high atmospheric pressure typically found south of the Azores in the Atlantic Ocean, at the Horse latitudes. It forms one pole of the North Atlantic oscillation, the other being the Icelandic Low. The system influences the weather and climatic patterns of vast areas of North Africa and Europe, and to a lesser extent, eastern North America. The aridity of the Sahara Desert and Mediterranean Basin is due to the subsidence of air in the system. 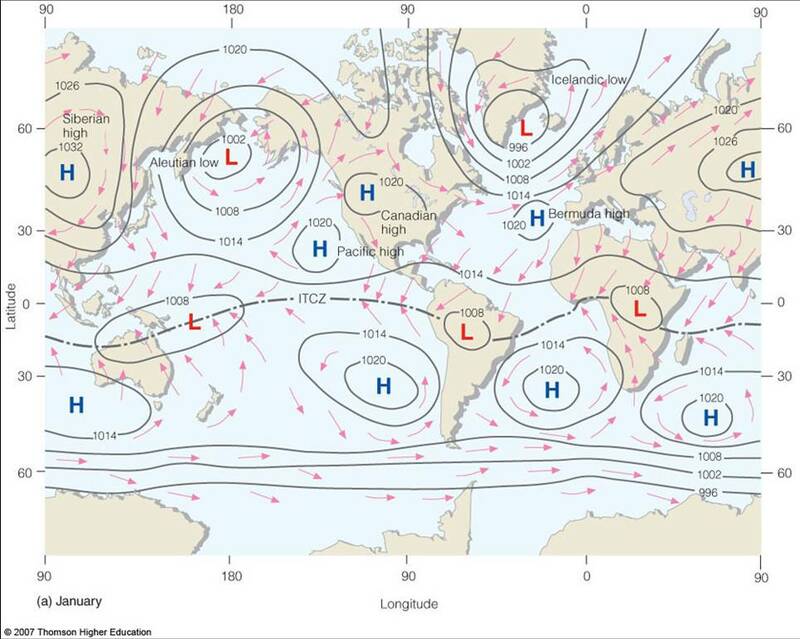 In summer, the central pressure hovers around 1024 mbar (hPa). When it moves north towards the Iberian Peninsula it causes ridging to develop for short periods across northern France, Benelux, Germany and southeastern United Kingdom. This brings hot and dry weather to these areas normally affected by prevailing westerlies. The Azores High is known more commonly as the Bermuda High because of the strong westward ridging that develops near Bermuda, usually after the summer solstice. This can contribute to intense heat waves in the eastern United States and, spotty drought. Before the onset of winter, the High moves south of the Azores, allowing low pressure systems to invade the Iberian Peninsula and the Mediterranean. One of the very best ways to understand the changes taking place on Planet Earth is to make observations from space. And to get a true sense of any trends, you really need those measurements to be long-term and unceasing. Preferably, you use the same type of instrument to make the observations, and when, inevitably, you're required to replace aging equipment, you do so in such a way that the new system can be cross-calibrated with the old. Small, blocky shapes of towns, fields, and pastures surround the graceful swirls and whorls of the Mississippi River. Countless oxbow lakes and cutoffs accompany the meandering river south of Memphis, Tennessee, on the border between Arkansas and Mississippi, USA. The “mighty Mississippi” is the largest river system in North America. This image, taken by Landsat 7 on May 28, 2003, won 3rd place in the online “Earth as Art” competition to celebrate the 40th anniversary of the Landsat satellite program. Few Earth observation programmes get as close to this gold standard as Landsat, the cooperative space mission run by US space agency (Nasa) and the US Geological Survey. For 40 years now, the Nasa/USGS satellites have maintained a permanent eye on Earth. It was during the Apollo preparations - when astronauts would also take pictures of their home planet as they tested their Moon technologies - that the idea was born for a dedicated imaging system to observe the Earth. It led to the development of the Earth Resources Technology Satellite (ERTS), launched on 23 July 1972 and operated for six years. Subsequent platforms picked up the baton. Today, Landsat-7 maintains the watch, with its successor, Landsat-8, being readied for lift-off next month. The latest incarnation will go up from California's Vandenberg Air Force base on an Atlas rocket, and, after a few weeks of checks, assume the lead role of imaging the planet from an altitude of 705km. Along the southern coast of the Netherlands, sediment-laden rivers have created a massive delta of islands and waterways in the gaps between coastal dunes. After unusually severe spring tides devastated this region in 1953, the Dutch built an elaborate system of dikes, canals, dams, bridges, and locks to hold back the North Sea. Image taken on September 24, 2002, by the ASTER instrument aboard NASA’s Terra satellite. The Landsat spacecraft view the Earth in visible and infrared wavelengths, and track details as small as 30m across. It's true there are imaging sensors up there now that will return pictures of Earth with far better resolutions (in the tens of centimetres), but for the job Landsat is trying to do, the 30m/pixel view is perfect. Akpatok Island lies in Ungava Bay in northern Quebec, Canada. Accessible only by air, the island rises out of the water as sheer cliffs that soar 150 to 243 m above the sea surface. Akpatok Island is an important sanctuary for cliff-nesting seabirds. Numerous ice floes around the island attract walrus and whales, making Akpatok a traditional hunting ground for native Inuit people. Image taken January 22, 2001, by Landsat 7. Over its 40-year history, Landsat has catalogued the growth of the megacities, the spread of farming and the changing outlines of coasts, forests, deserts and glaciers. It has monitored fires and volcanic eruptions. It has even detailed the behaviours of Antarctic penguins and North American beetles. The Lena River, some 4,500 km long, is one of the largest rivers in the world. The Lena Delta Reserve is the most extensive protected wilderness area in Russia. It is an important refuge and breeding ground for many species of Siberian wildlife. This is a false-color composite image made using shortwave infrared, infrared, and red wavelengths. Image taken July 27, 2000, by Landsat 7. "One [application] that we're particularly proud of is the use of something we call the thermal band," explained Matt Larsen, the associate director for climate and land-use change at the USGS. "This is a technique by which we can estimate the temperature of the surface of the Earth from the sensors on the Landsat satellite, and from that we can measure evapotranspiration (the conversion of water to water vapour). "Why do we care about that? That's a key part of agricultural activity, and in the western US where we have a huge amount of land in irrigated agriculture, it allows us to better understand how much water we are using, how much water we need and how that might be affected in the future because of changing stream flows because of changing temperatures," he told the BBC World Service's Science In Action programme (listen to our feature). Landsat-8 will carry an additional thermal band that will lead to more precise measurements. The Paraná River delta is a huge forested marshland about 30 km northeast of Buenos Aires, Argentina. The area is a very popular tour destination. Guided boat tours can be taken into this vast labyrinth of marsh and trees. The Paraná River delta is also one of the world’s greatest bird-watching destinations. This image highlights the striking contrast between dense forest and wetland marshes, and the deep blue ribbon of the Paraná River. This is a false-color composite image made using shortwave infrared, near infrared, and green wavelengths. Image taken May 26, 2000, by Landsat 7. The uses of Landsat data really are innumerable. Paul Donald, a conservation scientist with the UK's Royal Society for the Protection of Birds (RSPB), gives a great example of how these pictures can be used to understand the geographical distribution of very poorly known avian species. You cannot see the birds from space, obviously, but you can map their likely habitat. "One of the ways we can do this is to use a modelling technique, where we take Landsat data and we match that with areas where we know the birds are; and that will then give us a very good description of where the bird may be where people have never even been to look for it," he told us. "The results have been extraordinary. We've generated maps using Landsat imagery which have predicted areas we never thought suitable for this bird. We've gone there, and we've found the bird." The tongue of the Malaspina Glacier, one of the largest piedmont glaciers in the world, fills most of this image. The Malaspina lies west of Yakutat Bay in Alaska and covers roughly 3,900 sq km. This image was acquired on August 31, 2000, by Landsat 7′s Enhanced Thematic Mapper plus (ETM+) sensor. This is a false-color composite image made using infrared, near infrared, and green wavelengths, and has been sharpened using the sensor’s panchromatic band. Landsat-8 is more formally called the Landsat Data Continuity Mission (LDCM). This mouthful reflects the rather tortured route the mission had to take to get budget approval. It's a perennial problem for Earth observation missions - getting a timely sign-off from the politicians so that an enduring presence in orbit can be maintained. Even with Landsat, it is as if each satellite was born an only child, and the next mission had to fight for justification as if there had been no heritage. Ephemeral Lake Carnegie, in Western Australia, fills with water only during periods of significant rainfall. In dry years, it is reduced to a muddy marsh. This image was acquired on May 19, 1999, by Landsat 7′s Enhanced Thematic Mapper plus (ETM+) sensor. This is a false-color composite image made using shortwave infrared, infrared, and red wavelengths, and has been sharpened using the sensor’s panchromatic band. Nasa, USGS and the Federal Office of Management and Budget (OMB) are now seeking a long-term solution that would see Landsat-9 and all following spacecraft arrive on a predictable track. It is the sort of assurance Earth observation seeks in Europe, also. At the end of this year, the European Space Agency will start to roll out the multi-billion-euro Sentinel fleet of satellites, which aim to echo the Landsat philosophy but with many more types of sensor. However, even as the first mission is prepared for launch, politicians are still arguing over how the project should be funded. The Gulf Stream is a powerful current in the Atlantic Ocean. It starts in the Gulf of Mexico and flows into the Atlantic at the tip of Florida, accelerating along the eastern coastlines of the United States and Newfoundland. It is part of the North Atlantic Subtropical Gyre, one of the five major oceanic gyres, which are large systems of circular currents and powerful winds. The Gulf Stream is a western boundary current; its behavior is determined by the North American coastline. Trade winds from Africa drive water in the Atlantic westward until it hits the coastline and gets pushed northward. In turn, the Gulf Stream affects the climate of the areas closest to the current by transferring tropical heat toward the northern latitudes. There is a consensus among scientists that the climate of Western and Northern Europe is warmer than it would be otherwise because of the North Atlantic Current, one of the branches of the Gulf Stream. The first mention of the Gulf Stream can be traced to the 1513 expedition of Juan Ponce de León. On April 22, 1513, he wrote in his voyage log: "A current such that, although they had great wind, they could not proceed forward, but backward and it seems that they were proceeding well; at the end it was known that the current was more powerful than the wind." Explorers Peter Martyr d'Anghiera, and Sir Humphrey Gilbert also made note of the powerful Gulf Stream, and it became widely used by Spanish ships sailing from the Caribbean to Spain. Six years after Ponce de León's notation, Anton de Alaminos set sail for Spain from Vera Cruz, Mexico, using the Gulf Stream, following the Florida coastline northward before turning eastward to Europe. He had served as the chief pilot aboard Ponce de Leon's ship on his earlier trip and had also sailed with Columbus on his last voyage. Some historians credit Alaminos with the discovery of the Gulf Stream because he was the first to take advantage of it. Hernando Cortez was perhaps the first to send large numbers of ships from Mexico northward through the Florida Straits, then eastward following the clockwise motion of the Gulf Stream to return to Spain. Because it altered sailing patterns and shaved time off a typically long and treacherous trip, the Gulf Stream was instrumental in the colonization of the Americas. Most voyages to Virginia southward chose the southern route across the Atlantic even though it was 2,000 miles to 3,000 miles out of the way. Most return voyages to Europe took advantage of at least part of the Gulf Stream to speed their journey. In his role as deputy postmaster of the British American colonies, Benjamin Franklin had a keen interest in the North Atlantic Ocean circulation patterns as a way to streamline communication between the colonies and England. During a 1768 visit to England, Franklin discovered that it took British packets several weeks longer to reach New York from England than it took an average American merchant ship to reach Newport, Rhode Island. Franklin’s cousin Timothy Folger, a Nantucket whaling captain, explained that merchant ships routinely crossed the then-unnamed Gulf Stream while the mail packet captains ran against it. The merchant ships tracked whale behavior, measurement of the water's temperature and the speed of bubbles on its surface and changes in the water's color to follow the speedier route. Franklin worked with Folger and other experienced ship captains to chart the Gulf Stream and giving it the name by which it is still known today. Benjamin Franklin published the first map of the Gulf Stream in 1768. Franklin's Gulf Stream chart was published in 1770 in England — where it was ignored — and subsequent versions were printed in France in 1778 and the United States in 1786. It was years before the British finally took Franklin's advice on navigating the current but once they did, they were able to shave two weeks off the sailing time between Europe and the United States. This visualization of the Gulf Stream was produced using NASA/JPL's computational model called Estimating the Circulation and Climate of the Ocean, Phase II or ECCO2. Like many aspects of the environment, the Gulf Stream has been affected by global warming, and research indicates that the core of the Gulf Stream moved 125 miles north in 2011. Some scientists are concerned that melting glaciers will send cold water into the current and disrupt the Gulf Stream's flow. There is a possibility that without the warmth delivered by the Gulf Stream, Northern Europe could enter a new ice age. in a photo taken on Jan. 19, 2013 and released on Jan. 20. The window of opportunity to safely remove the USS Guardian from the delicate Tubbataha Reef is closing fast, as weather conditions associated with the Amihan northeastern monsoon are expected to worsen over the next few days. "The strong northeasterly wind and the associated big waves could affect any operation to rescue the US vessel. One thing to consider is there is another surge of the northeast monsoon this week, so expect stronger winds and heavier seas," GMA News' resident meteorologist Nathaniel "Mang Tani" Cruz said. One method for extricating the ship being discussed by the US Navy is lifting the stuck 68-meter-long minesweeper from the reef and placing it on a larger ship. "One-meter wave heights may not be that high considering the size of the vessel. (But) if they will do something, the window of opportunity is now as the northeast monsoon is still weak," Mang Tani explained. based on the January 18 incident report of the Tubbataha Protected Area Management Board. Also shown are the inner and outer boundaries of the Reef, as defined by Republic Act 10067. Based on Weather Central data, the northeast monsoon or "Amihan" is the prevalent weather system affecting the area of Tubbataha reef, bringing cold winds from the direction of northeastern Luzon. But Mang Tani warned that the monsoon is likely to gain in strength in two to three days, before the weekend. Weather Central data shows that, as of Tuesday morning, wave heights in the area of Tubbataha Reef are expected to reach one meter in the next 24 hours. However, PAGASA forecaster Jori Lois told GMA News Online that the agency's data indicates that waves in the area may reach as high as two meters. On the other hand, no rains are expected within the area, so rescuers can expect generally clear skies for at least the next 24 hours. Weather Central's rainfall forecast for the 24 hours ending 9 a.m. Wednesday shows generally clear weather in the Tubbataha area, with possible light rainshowers west of the reef on Tuesday afternoon. A melt pond in the Arctic ice. Credit : Stefan Hendricks, Alfred Wegener Institute. During the Arctic spring and summer, ponds of freshwater appear on the melting ice, dotting the landscape with a dazzling range of blues. 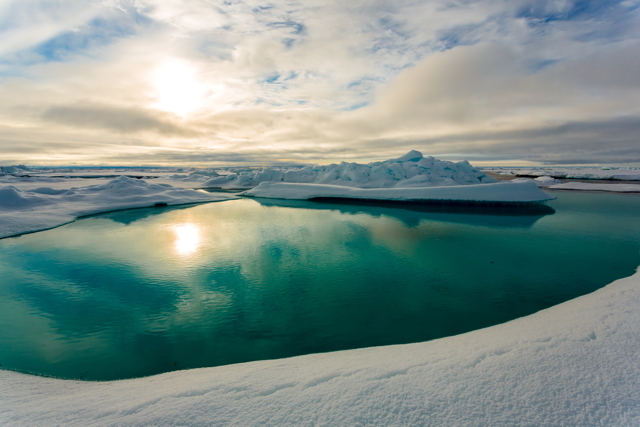 Despite their beauty, these melt ponds are a harbinger of climate change in the Arctic, according to a new study by researchers at the Alfred Wegener Institute in Germany. The pools form more easily on young ice, and young ice now accounts for more than 50 percent of the Arctic sea ice cover. The ponds also absorb more of the sun's heat, helping ice melt faster, the study finds. Graphic depiction of the amount of sunlight above and underneath the Arctic sea ice. The growing coverage of the ice by darker meltponds increases the share of sunlight, which passes the sea ice. That means, the space underneath the ice becomes brighter and warmer. Furthermore less sunlight is refleced back into the atmosphere. 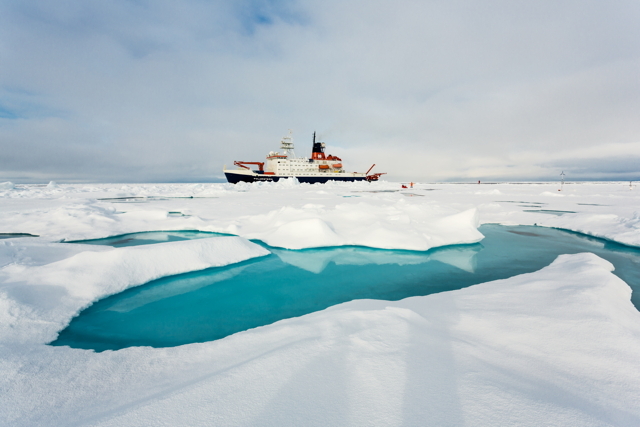 To test the effect of the melt ponds on sea ice, scientists from the institute traveled to the Arctic aboard the research ice breaker RV Polarstern during the summer of 2011. The German research ice breaker RV Polarstern next to a typical sea ice melt pond. They analyzed how far the sun's rays penetrated the ice with a remotely operated underwater vehicle equipped with radiation sensors and cameras. Photo, taken by the ROV during its dive through deformed sea ice. The marker bars are one meter long. In the background one can see that more sunlight passes the sea ice, because the ice is covered by meltponds. The numbers and symbols, which are faded in, tell the direction and position of the ROV. They are needed by the pilot to steer the underwater roboter. Arctic sea ice has become distinctly thinner and younger in the past decade, the researchers said in a statement. The amount of 3-foot-thick (1 meter), multiyear ice, which lasts through seasonal melts, is declining. This older ice has a rough surface, created by the constant motion from currents and collisions. Far fewer and smaller ponds appear on this uneven surface, though they were considerably deeper than the flat ponds on the younger ice, the researchers found. Aerial photo of polar researchers working on sea ice. Some of them belong to the AWI sea ice physics group. They have ericted a tent, in which the steering console of the ROV (Remotely Operated Vehicle) "Alfred" is stored. But almost half of the thin, year-old ice floes are extensively covered with melt ponds, the researchers discovered. AWI sea ice physicist Dr. Marcel Nicolaus is measuring the depth of a meltwater pond during an Arctic expedition of the research vessel POLARSTERN (expedition ARK XXVII-3). "The decisive aspect here is the smoother surface of this young ice, permitting the melt water to spread over large areas and form a network of many individual melt ponds," Marcel Nicolaus, a sea ice physicist and melt pond expert at the Alfred Wegener Institute, said in the statement. Young, thin ice with many melt ponds allowed three times as much light to pass through than older ice, Nicolaus said. It also absorbed 50 percent more solar radiation, which causes more melting and means the thin ice reflected less of the sun's rays than thick ice. "The ice melts from inside out to a certain extent," Nicolaus said in the statement. The research team is now investigating how additional sunlight will affect organisms that live on and beneath the Arctic ice, such as algae that clings to the ice floes. "We assume that in the future, climate change will permit more sunlight to reach the Arctic Ocean — and particularly also that part of the ocean which is still covered by sea ice in summer," Nicolaus said. "The sea ice will become more porous, more sunlight will penetrate the ice floes and more heat will be absorbed by the ice. This is a development which will further accelerate the melting of the entire sea ice area," Nicolaus said. The study appeared online Dec. 29 in the journal Geophysical Research Letters. Hackerfleet is a Berlin-based collective of volunteer computer hackers, software developers and programmers crafting a new generation of ultra-smart sailing software on their own sailing yacht out in the middle of the ocean. Resting on the icy cool surface of the Baltic Sea, a rickety old boat of hardy sailors works long into the night. Eyes strained, minds stretched, many have gone days without sleep. But this is no ordinary vessel of sea-faring adventurers battening down the hatches as they get set to navigate stormy waters. 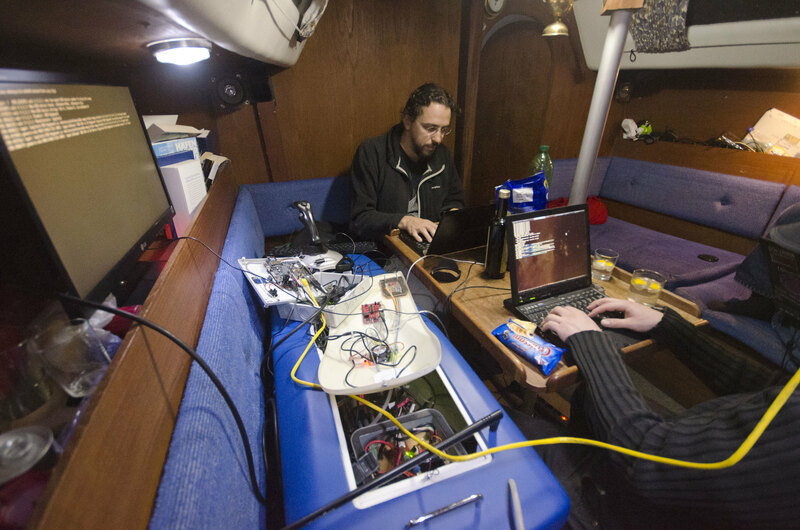 This is Hackerfleet -- a Berlin-based collective of volunteer software developers and programmers burning the midnight oil as they craft a new generation of ultra-smart sailing software. "We work on a ship because it's fun and everybody likes that," said "Ijon" (an online pseudonym) the organization's co-founder. "You can't leave ... [and] everyone is very focused. It's intense and we get very little sleep but the method is overwhelmingly beneficial as a source of ideas," he added. Founded by the covertly named Ijon and Riot, the group set sail to carry out their work at sea when they can. Most cruises last between three and five days and can be attended by as many as 15 to 20 people depending on the scale of the work expected to be done. 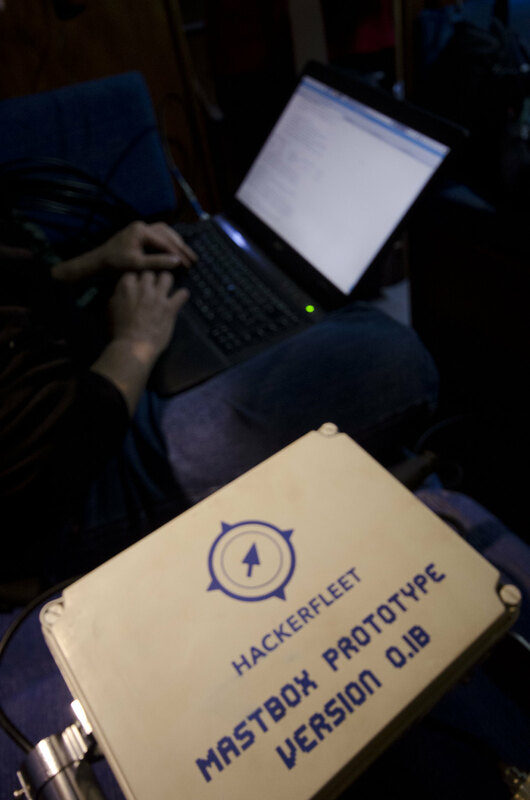 Founded in the summer of 2011 by Ijon and his business partner "Riot", Hackerfleet offers a mariner's twist on the long-popular hackathon concept. Groups of programmers and engineers gather to share skills, knowledge and embark on intense code writing sessions, casting off from shore when they can to carry out their work. Most "Hacker Cruises" last between three and five days and can be attended by as many as 15 to 20 carefully selected people, Ijon said. 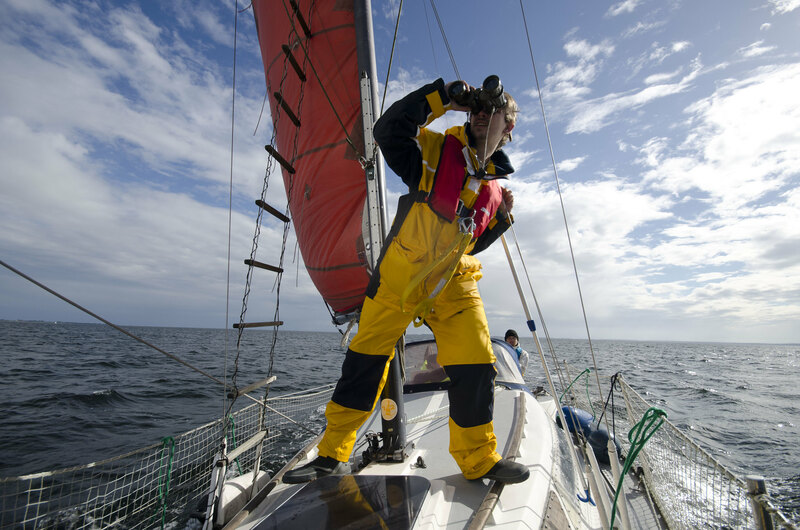 Each crew-member generally has a specialist skill or area of technical expertise. This means they offer something unique and worthwhile to the project. "It's an unusual workspace," said "Keyboardsurfer", a volunteer computer hacker and expert in android platforms. "(But) we're pushing each other to create something that amazes everyone." "The possibility to communicate with every participant whenever it's needed makes the work on sea very effective," he added. So far Hackerfleet's voyages have produced an android app that charts the location of buoys and sea-signs as well a "virtual helmsman" that can autonomously hold the course of any ship. The group's ultimate aim, though, is to create a completely new type of sailing software that will connect all boats at sea -- essentially transforming them into floating data-collection devices. This mass connectivity will enable Hackerfleet to gather, store and ultimately transmit back out to sea vast amounts of important marine information. Some of the most detailed depth charts, maps, weather measurements, ocean safety warnings and wildlife monitors ever created are all within the realm of possibility should the plan come to fruition, Ijon claims. "We want to develop the biggest database on oceans and sea information that is imaginable and theoretically possible," he said. "If every ship (both commercial and recreational) shares what it knows then we can centralise this data at one point in the database allowing us to calculate things much more accurately. "We can then send out this information to all ships that have our systems installed." 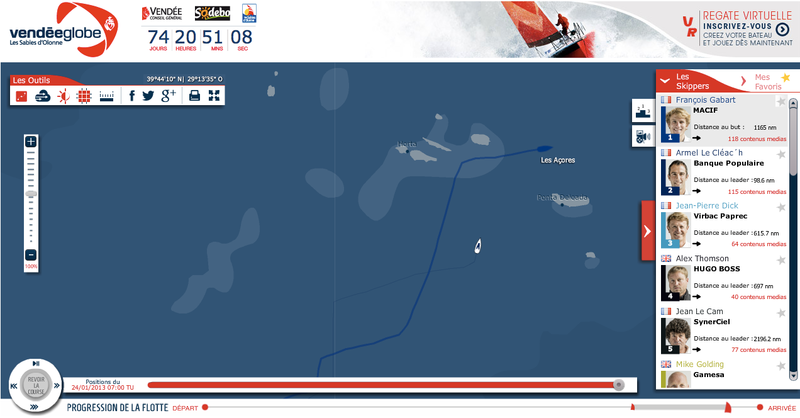 The group's ultimate aim is to popularize its Mastbox technology -- a completely new type of sailing software that will connect all boats at sea, essentially transforming them into floating data-collection devices. Ijon says he expects the first consumer-ready prototype version of this "Mastbox and Shipbox" technology to be available by early 2014. Commercial deployment is then expected to follow in either 2015 or 2016. Popularizing the software once complete however will likely provide a whole new set of challenges, each requiring more than just a clever code or hack to address. The user-generated nature of the technology means it will have to be adopted by vast numbers of boats to fulfil its full potential -- although a chunk of data the system relies on is already publicly available and used by other on-board computer systems. The MS 0x00 is our first autonomous ship. Currently very limited in its engine power, it serves us as testing and benchmarking platform for hardware and software. 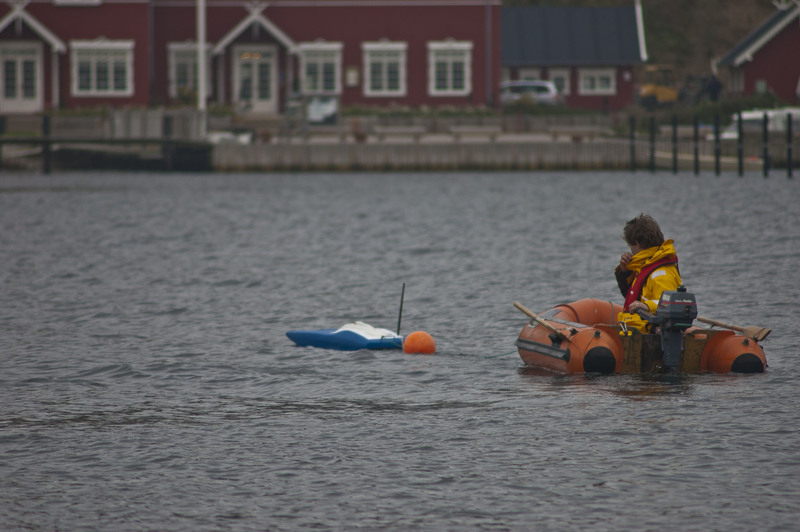 A member of Hackerfleet follows the MS0X00 as it makes its maiden voyage, ensuring no mishaps occur. Ultimately though, Ijon maintains that commercial success is not a primary concern of the Hackerfleet. The organization remains an operation run by friends with a mutual passion for the seas and technology. As such, all software is currently given away for free and any code developed remains open-sourced. "Essentially, it's less about earning money and more about getting the seafarer and his ship on the next technological level in the 21st century," Ijon said. "We expect to be paid for our work at some point but we want to do this in the right way, the morally correct way," he explained. "This (technology) could potentially give us the best information stock for crews and captains to decide on ... and for us that is what's most important for now." In this clip, Dorian gives us the play-by-play of a 50-foot barrel he rode at Jaws a few months ago. The situation: just trying to get a small one in. The drop: perfectly clean — until the giant boil. The claim: not even halfway through. It was a perfect wave that only he could have surfed so perfectly, claimed by Shane Dorian as the greatest wave he's ever caught in his life.